More info available from the official product page. On a fateful December day in 1941 the sound of sirens shrieked across the vastness of the Pacific as the military forces of Imperial Japan struck against an unprepared foe. Within hours the main battle line of the United States Navy lay in Pearl Harbor with broken backs and shredded hulls, the sea awash with blood and oil, while all across the Pacific American, British, and Dutch forces suffered defeat. While the toll was terrible at Pearl Harbor it could have been much worse. No carrier had been in port, the submarine force had barely been touched, and most importantly the massive fuel tank storage facilities went unscathed. Instead of slaying the giant the Japanese only awoke it. By mid-1942 Japan's dream of uniting the Pacific under the Greater East Asia Co-prosperity Sphere began to fade with the defeat of the Imperial Japanese Navy at Midway. From that point forward the struggle between the Allies, led by the United States, and Japan became one of attrition. Slowly Japanese territorial gains began to shrink, as the Allies began to close an ever-shrinking ring around Japan through a campaign of island hopping in the Pacific and bitter jungle warfare on the mainland of Asia. In 1945 the ring had closed and the Allies were faced with the prospect of a long bloody invasion of the home islands of the Empire of Japan unless they could force surrender. Ushering in a new age of warfare the United States did force that surrender, thanks to the use of two atomic weapons that saved countless lives of Allied servicemen, ending once and for all Japan's Imperial ambitions. In KE Studios' War Plan Pacific players take on the role of the supreme commanders of either the Japanese or Allied forces fighting for dominance of the Pacific during the Second World War. Commanding the historical air, naval, and (abstractly) ground forces that fought in the epic clash will history repeat itself or will the war end with the Americans, exhausted from years of bloody battle, negotiating a peace treaty with Japan? War Plan Pacific takes a bold approach to grand strategic wargaming. 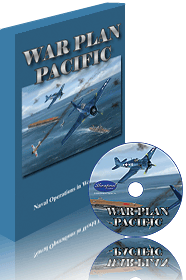 Balancing historical reality and gaming playability, War Plan Pacific makes commanding entire fleets and air groups highly intuitive, allowing gamers to easily concentrate on strategy rather than being bogged down in minutiae as would be expected in a game featuring such a massive scope of conflict. Not only that but War Plan Pacific was designed from the start to be playable in a single session! That's right, a Pacific War title that doesn't take as long as the real war to complete. With multiple victory conditions, extensive air and naval orders of battles, exciting battles with just the right amount of chrome to make them shine, the ability to face off against either the challenging AI or another live opponent, War Plan Pacific is a rewarding game that offers endless replayability. And with a session length measured in hours--not days, weeks, or months--this is one strategic war game that you have no excuse not to play even in today's hectic world. Will surrender come on the deck of the Missouri or the Yamato? Find out when you make your own destiny with War Plan Pacific! - Turn based grand strategy wargame of the war in the Pacific from 1941 until 1945, influenced partially by the classic Avalon Hill board game, Victory in the Pacific. - Playable by one or two players. Multiplayer is supported via Internet play. - An emphasis on playability allows a complete game to be played in under three hours. That's right, from Pearl to Nagaski in three hours. - The theater of operation ranges from Singapore in the east to San Francisco in the west and the Aleutians in the north and Brisbane in the south. Point-to-point based movement. One month turns. - Twenty nine bases of strategic and historical importance. - Eye-catching digital counters of individual historical ships of light cruiser or larger size, amphibious transport groups, convoys and air groups representing the forces of the Imperial Japanese Navy, United States Navy, Royal Navy, Royal Australian Navy, and Royal Netherlands Navy. - Three scenarios. One purely historical, two with alternate set ups. - Two victory conditions for each side: one a "quick" win while the other a slower win. As the Japanese isolate Australia or survive until the American public loses its taste for war. As the Allies strangle Japan's oil supply or force them to the surrender table through a massive ♦ Scenario files are XML text files that can be edited, which also allows the OOB and ship capabilities to also be modified. Likewise, base information, sea distances, and relevance to victory conditions can also be changed. - Turns consist of forming and disbanding task forces and assigning them to either patrol, raid, or invade. Patrol defends friendly bases, raids assault enemy bases and their defending forces while invasions attempt to capture and control enemy bases. Additional turn elements include designating ships for repair, supply efforts, and land based air location. - Combat is fast paced and uses a virtual 'Battle Board' with players choosing to engage their foe in gunnery duels or over the horizon with the use of air power. Air strikes must face CAP and flak, while in surface battles the Long Lance torpedo can be an Allied vessel's worst nightmare. Invasions involve transport groups attempting to overwhelm a base's defenders, softening up targets with pre-landing aerial and surface bombardments. - Plenty of tough choices! With never enough forces to cover the vast Pacific, and with the need to be both offensive and defensive, each turn is one of exciting choices. Historical advantages, disadvantages, and doctrine have been built into the game without the need of cumbersome rules or mechanics, allowing War Plan Pacific to model the war but keep the game playable in a single session. - Each side offers a unique playing experience, keeping gamers constantly engaged in the strategic cat and mouse game that marked the war in the Pacific.